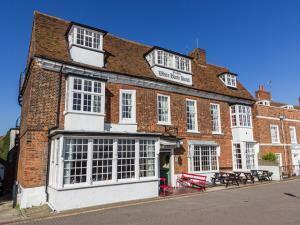 Ye Olde White Harte01621 782106work Restaurant17th century building with many original exposed beams and fire places overlooks the River Crouch. The Waterside restaurant offers lunchtime and evening Tablé d'hoté with full à la Carte menus. Seats 50. Full Licence. Follow the A127 (London bound), take the turn off sign posted Chelmsford A130 and continue for approximately 2 miles. Join the A132 sign posted South Woodham Ferrers. Go over the roundabout and follow the B1012 towards Burnham-On-Crouch. Continue through Althorne via the B1010, along the Burnham bends and you will arrive in Burnham. Turn right at the T junction, go over the railway bridge and continue down the high street. Go past the War Memorial and turn right at the clock tower up Shore Road. The hotel & car park is on the right 50 yards up Shore Road. Follow the A414 into Danbury and continue through Danbury until you reach the B1010 (Burnham Road). Continue along the B1010, through Althorne and into Burnham. Turn right at the T junction, go over the railway bridge and continue down the high street. Go past the War Memorial and turn right at the clock tower up Shore Road. The hotel & car park is on the right 50 yards up Shore Road. Continue down the A12 south bound and turn off after junction 23 at Rivenhall End (Braxted Road). Turn right and continue down the B1022 (Maldon Road). Go through Great Totham and Heybridge until you reach Maldon. Pick up the A414 until you reach the Morrisons roundabout. Turn left onto the B1018 for approximately 1 mile then turn right onto the B1010. Continue along the B1010 towards Burnham, passing through Althorne along the way. Turn right at the T junction, go over the railway bridge and continue down the high street. Go past the War Memorial and turn right at the clock tower up Shore Road. The hotel & car park is on the right 50 yards up Shore Road. Follow the A13 (east bound) sign posted Southend-On-Sea. Continue past the Dartford Crossing and Basildon and join the A130 sign posted Chelmsford and continue for approximately 2 miles. Join the A132 sign posted South Woodham Ferrers. Go over the roundabout and follow the B1012 towards Burnham-On-Crouch. Continue through Althorne via the B1010, along the Burnham bends and you will arrive in Burnham. Turn right at the T junction, go over the railway bridge and continue down the high street. Go past the War Memorial and turn right at the clock tower up Shore Road. The hotel & car park is on the right 50 yards up Shore Road.